The perimeter wall sheathing is completely nailed before roof framing begins. The sheathing stiffens the frame, finalizing bearing points, tie downs, and connectors as a unified structural system in preparation for the roof loads. 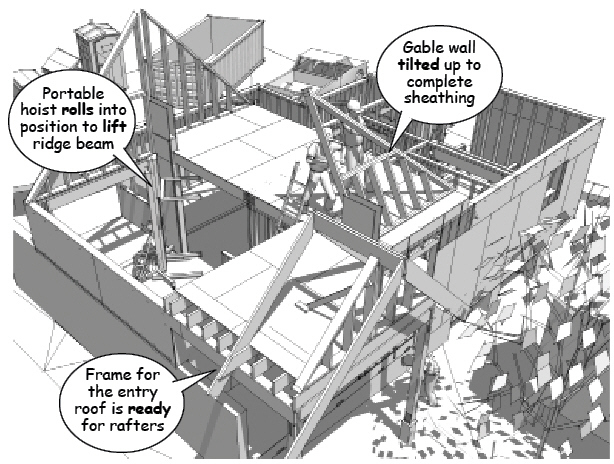 Because of the open ceiling in this example, these preparations also include framing beam pockets into the shear and gable walls that support the main ridge beam. These triangular walls are shaped to follow the slope of the rafters. The ridge beam bears on vertical extensions of the shear walls and the sheathed gable walls work to resist movement perpendicular to the axis of the roof line. Note that the shear walls are embedded between the gable walls so that a length of the ridge beam is fixed into position. 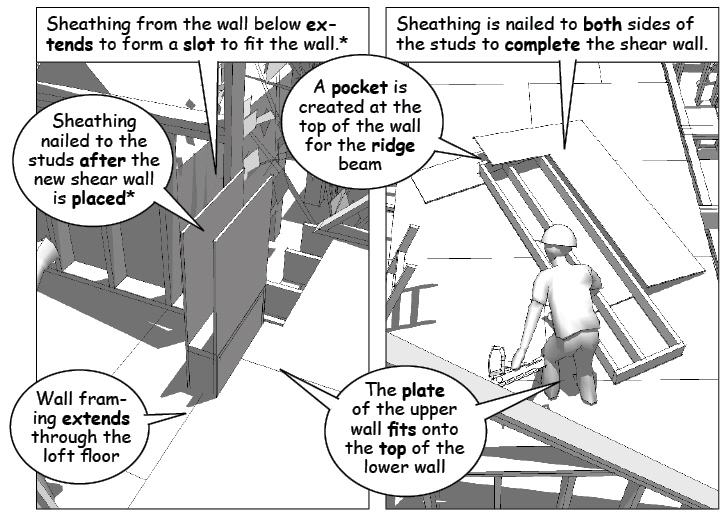 The upper portion of the shear walls are bolted to the lower wall using tie downs and the structural nailing pattern. 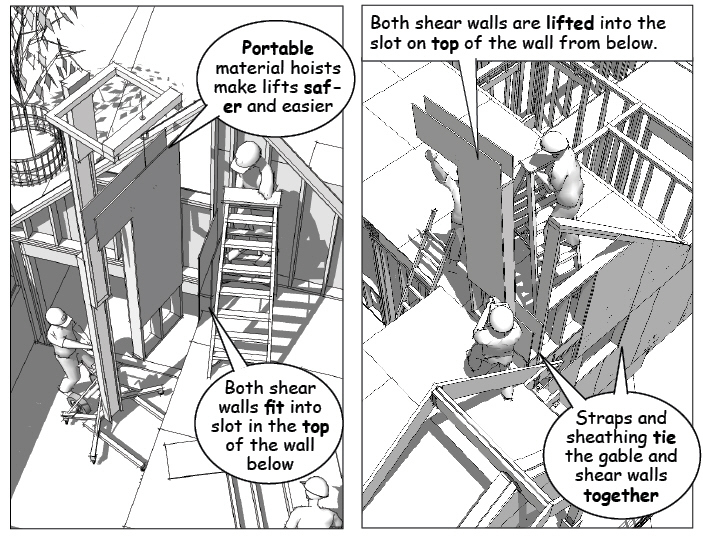 The sheathing on both sides of the shear wall transfers lateral loads through the wood frame to the foundation. Once in place, the roof supports extend from the ridge beam and rafters down through the loft floor to the tie downs at the foundation stem wall. In some cases, steel straps are added to strengthen the moment resistance of the stud walls. After a final check, the area is cleared of unnecessary tools and materials and the ridge beam is ready to be set in place. 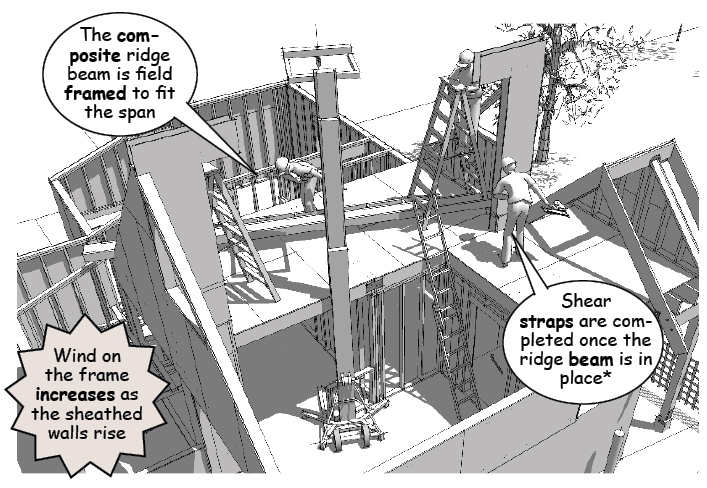 Options for lifting the ridge beam include a floor hoist as shown in this construction model or a light duty crane similar to those used by sign contractors or tree service companies. Overhead safety is again of primary importance. 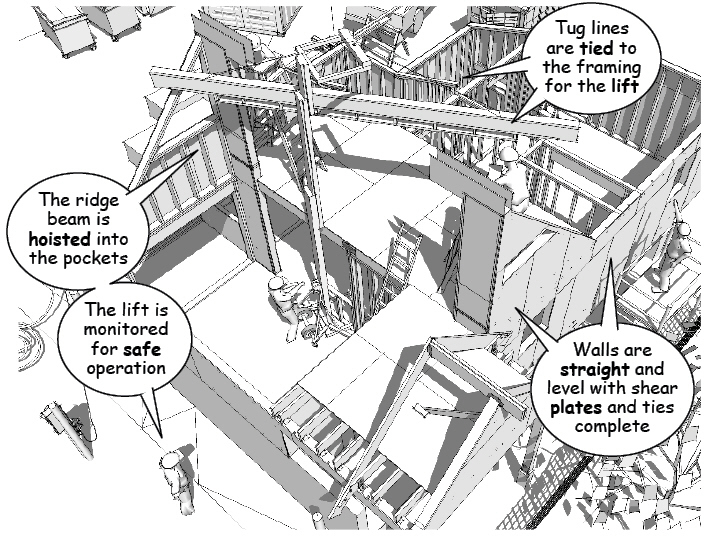 Critical concerns include marking safe zones for workers, a safety observer to watch the lift as the beam is positioned, securing equipment, assessing unusual site conditions, and the experience of the carpentry crew.